This handbook and ready reference presents a combination of statistical, information-theoretic, and data analysis methods to meet the challenge of designing empirical models involving molecular descriptors within bioinformatics. 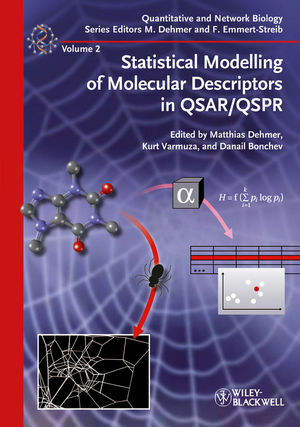 The topics range from investigating information processing in chemical and biological networks to studying statistical and information-theoretic techniques for analyzing chemical structures to employing data analysis and machine learning techniques for QSAR/QSPR. The high-profile international author and editor team ensures excellent coverage of the topic, making this a must-have for everyone working in chemoinformatics and structure-oriented drug design. Matthias Dehmer studied mathematics at the University of Siegen (Germany) and received his Ph.D. in computer science from the Technical University of Darmstadt (Germany). Afterwards, he was a research fellow at Vienna Bio Center (Austria) and at Vienna University of Technology. Currently, he is an Associate Professor at UMIT - The Health and Life Sciences University (Austria). His research interests are in bioinformatics, chemical graph theory, systems biology, complex networks, statistics and information theory. In particular, he is also working on machine learning-based methods to design new data analysis methods for solving problems in computational biology and medicinal chemistry. Kurt Varmuza studied chemistry at the Vienna University of Technology (Austria). His research activities were first mass spectrometry and then moved to chemometrics - mainly the application of multivariate statistical analysis for chemistry related problems, such as spectra-structure relationships and structureproperty relationships. Since 1992, he has been working as a professor at the Vienna University of Technology, currently at the Institute of Chemical Engineering. Danail Bonchev received his Ph. D. in quantum chemistry in Sofia, Bulgaria and D. Sc. in mathematical chemistry from the Moscow State University in Russia. He worked till 1992 as a professor of physical chemistry in the Assen Zlatarov University in Bourgas, Bulgaria. In 1992 he joined Texas A&M University at Galveston, and since 2003 he is professor at Virginia Commonwealth University in Richmond. His research includes quantum chemistry, molecular topology, QSPR and QSAR and, recently, bioinformatics and computational biology.